We'll keep you updated on Village Capital events happening near you, news from our programs, stories about our entrepreneurs, and other relevant updates. Sign up now! No matter who you are or where you live, with Village Capital you’ll get a fair shot. VilCap’s peer-selection investment model will make you more money. Build professionally strategic and personally rewarding relationships. VilCap Communities enables investors and ecosystem leaders to democratize entrepreneurship everywhere, using our peer-review model. In our pilot year, 26 investors and ecosystem leaders have committed to invest more than $1.25 million in local companies through peer review. Learn more about VilCap Communities here. What if you could open a website that gave you personalized, step-by-step guides, trainings, and modules on how to run an effective investment readiness program? Everything from how to write recruit entrepreneurs to apply to your program to a full peer review ranking platform is included in our newly revamped Toolkit. 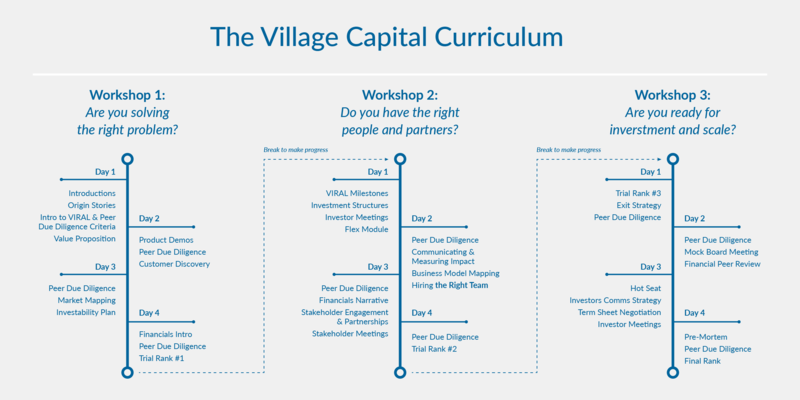 As a VilCap Community, not only will you have access to the materials to run a great program, but the Village Capital resources to train your facilitators, connect you to the right networks, and give sector-specific insights on your program focus. Be the go-to ecosystem builder in your city with our one-stop shop. "For some less developed entrepreneurial ecosystems, they don’t necessarily need the big dollars of venture capital. They need help to develop a crop of talented entrepreneurs. Programs such as this one are one way to do that." Here we drill into the value proposition, identify who key customers are, what they want, and how to deliver value to them. You may not be able to afford the team you need today to scale - that's why you raise money. Our Venture Investment-Readiness and Awareness Levels (VIRAL) framework helps identify the necessary team and have a plan on how to pay for them. Every investor has a VIRAL level. We will help you identify what VIRAL level investors are at so you save time and have more productive conversations. We answer these questions across three workshops spanning 12 days. VilCap Communities empowers communities across the world to identify the problems that need solving, and in turn enables entrepreneurs in those communities to solve these challenges in a local, contextual way. 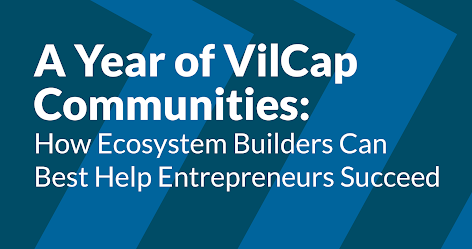 The VilCap Communities program launched with events in Salt Lake City (for US communities) and Amsterdam (emerging market communities) in early 2016. The pioneer communities that gathered for the US launch heard from leaders like AOL co-founder Steve Case, as well as their peers, about the importance of spreading the startup wealth beyond a few cities. Each of the 26 pioneer communities (16 in the United States and 10 in emerging markets) have committed to develop a problem thesis that their community is well-positioned to address; source local entrepreneurs with unique insights into the problem; and run venture development programs to train these entrepreneurs. Together, the 26 communities have pre-committed over $1 million to invest in local companies. Crucially, they will invest using Village Capital’s core innovation, peer selection, which lets entrepreneurs decide which of their peers gets funded, and has made the process of getting resources to build a company more open, transparent, and fair. Read more about VilCap Communities in our report here. This Toolkit helps Communities design and facilitate a Village Capital program. 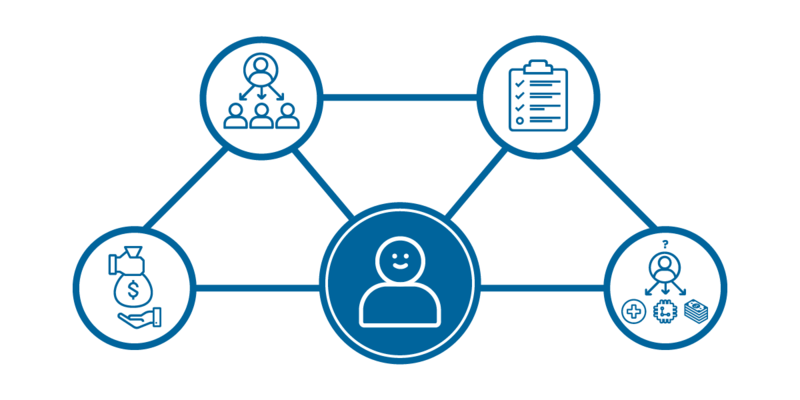 As a VilCap Community, you'll have access to all the tools, directions, and support needed to run a peer-selection program. Decide what sector and industry to focus on? Luckily we've put together a Toolkit to answer those very questions. VIRAL is the framework through which VilCap programs run. All curriculum and peer ranks are informed by this simple chart. VIRAL is meant to get investors and entrepreneurs speaking the same language and have a shared understanding of what entrepreneurs need to get to their next level of funding. Our curriculum will regularly refer back to these different categories, so be sure to familiarize yourself with them. Read more about VIRAL and the VilCap method here. Peer selection is the months-long process of cohort members receiving real-time, actionable feedback from their peers. Throughout the Village Capital process, entrepreneurs are constantly evaluating their own VIRAL levels through assessing their fellow entrepreneurs. Feedback is oriented around these categories to create targeted, useful feedback through radically transparent conversations and evaluation. At the end of the program, cohort members will have a better sense of where they are and what they need to succeed regardless of "winning" the investment money. Read more about Peer Selection here. Each of the three trial ranks in addition to the final rank are housed on our platform, programs.vilcap.com. You will receive a login and password to manage your cohort once you sign on as a Community. Once you are registered as a facilitator, you can add you program and cohort members to the platform. Village Capital is a global venture capital firm that finds, trains and invests in entrepreneurs solving real-world problems. Since 2009 we have invested in over 70 ventures across 15 countries and supported hundreds more through our collaborative investment-readiness programs. Village Capital graduates have leveraged initial capital 25:1, created over 10,000 jobs, and served over 6 million customers. For more information, visit www.vilcap.com and follow @villagecapital on Twitter. This is the public version of the VilCap Communities Toolkit. This site only includes one example of our 12 day program.